ULTRA Music Festival® has unveiled the Phase Two lineup for its nineteenth edition, taking place on March 24-26. Marking the official start of festival season, ULTRA Music Festival® has once again pulled out all the stops with its Phase Two reveal, as it adds over 40 performers to a lineup already brimming with top tier talent. Joining those announced during Phase One will be headliners Adam Beyer, Chase & Status, Cypress Hill, Galantis, KSHMR, Rabbit in the Moon, Zedd and ZHU. Beyer is set to headline RESISTANCE™ powered by Arcadia Spectacular’s vaunted SPIDER stage, while KSHMR will perform a very rare live set. 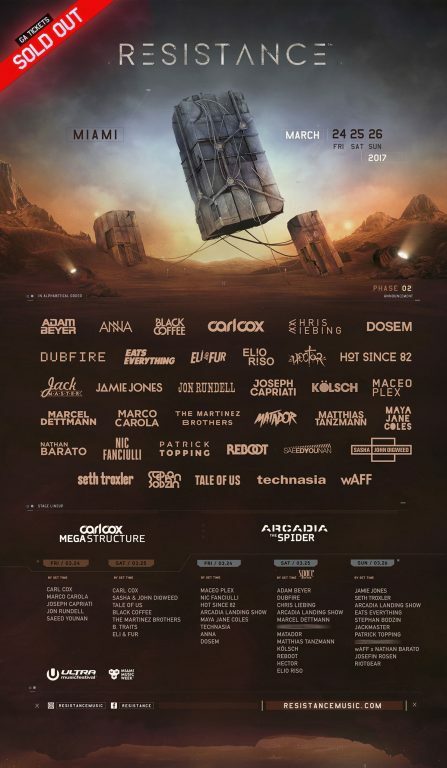 Phase Two sees supporting artists from just about every genre imaginable added, including Alan Walker, Datsik, Fedde Le Grand, Ferry Corsten presents Gouryella, GTA, Martin Solveig, Malaa, REZZ, Robin Schulz and Tchami among the plethora of names set to bring their talents to the World’s Premier Electronic Music Festival this March. The RESISTANCE™ lineup features the additions of Jackmaster, Marcel Dettmann, Maya Jane Coles, Nathan Barato, Patrick Topping, and Stephan Bodzin who will accompany Beyer on the Arcadia Spider throughout the weekend. Space Ibiza will introduce its new Space on Tour concept to Miami, curating Saturday’s RESISTANCE™ lineup on the Arcadia Spider. In addition, three highly acclaimed labels will take over the ‘UMF Radio Stage.’ ‘OWSLA’ will return for its third consecutive year, while Afrojack’s ‘Jacked’ imprint revisits the UMF Radio Stage for the first time since 2013. Last but not least, Diplo’s record label ‘Mad Decent’ will make its ULTRA Music Festival® debut. General Admission tickets are sold out for ULTRA Music Festival® 2017, however a very limited amount of VIP tickets are still available for purchase at UltraMusicFestival.com/tickets. For a full list of Phase Two artists, please see below. 2016 has seen the ULTRA and ULTRA WORLDWIDE™ brands continue to push the boundaries even further, bringing an unparalleled combination of cutting edge productions and the world’s best electronic acts back to previous strongholds and new frontiers across the globe. With the SOLD-OUT edition of ULTRA Brasil® Rio de Janeiro on October 14-15, ULTRA Singapore™ having become a full scale two-day festival on September 10-11, RESISTANCE’s standalone South America Tour and ROAD TO ULTRA®’s Hong Kong debut, the ULTRA brand has now united TWENTY COUNTRIES across FIVE CONTINENTS worldwide. In 2016 alone ULTRA WORLDWIDE™ produced TWENTY-SIX events spanning SEVENTEEN countries and FIVE continents.